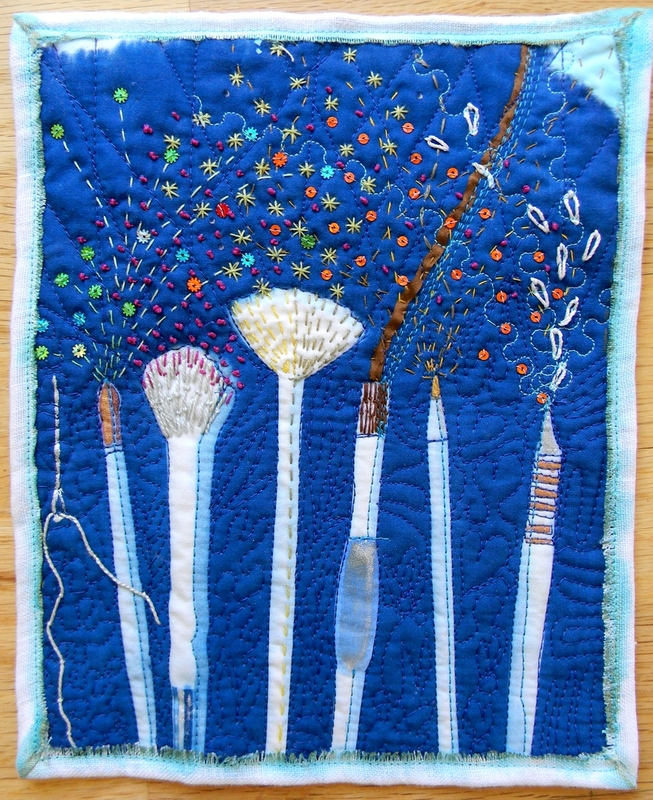 Tools of the Trade- featured in Quilting Arts magazine December 2015. This work was awarded second place in the Juried Gallery of the 2016 Lubbock Arts Festival. This work is a reversible banner that shows a night scene on the other side. It measures 15" x 60". Shanti-close up detail of lotus flower while in progress. Silk Road (2016) quilting, embroidery, dyeing, on solk and cotton. 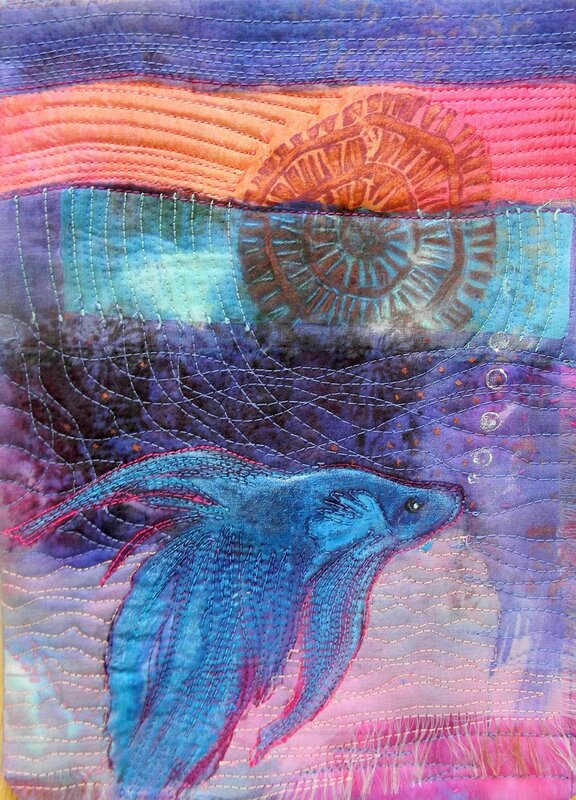 16" x 16"
Blue Betta- (2017) quilting, ice dyeing, acrylic, on cotton and silk. 5" x 7"
Van Gogh's Coffee. 2017. 20" x 20"
Finalist in the Cherrywood Fabrics Van Gogh challenge. Touring in France and various venues across the U.S. as part of the Van Gogh exhibition. Published. Urban Renewal. 2017. 33" x 33"
Free form, improvisational piecing and quilting in solid cotton fabrics. Owned by Ellna Henry. Small Abstract Quilt. 2017. 8"x 8"
From a series of three explorations in design and colour. Small Abstract Quilt. 2017 8 x 8"
From a series of three quilts exploring design and colour. Small Abstract Quilt. 2017 8"x 8"
Finalist in Quilting Arts magazine's Year of the Rooster challenge. 9"x 9". 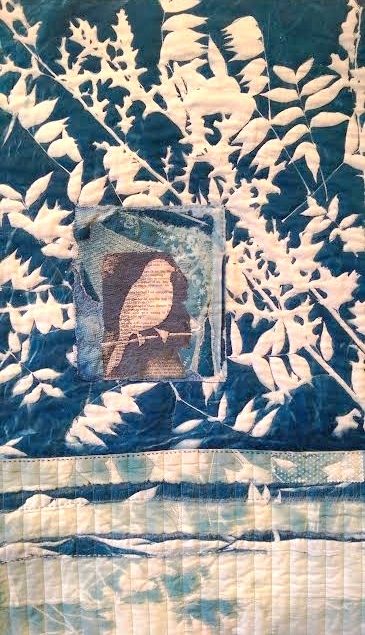 Quilting, embroidery, and surface printing on cottons and linen. Accepted into the 2018 Lubbock Arts Festival juried gallery. Displayed at the 2018 SAQA national conference in San Antonio, Texas. 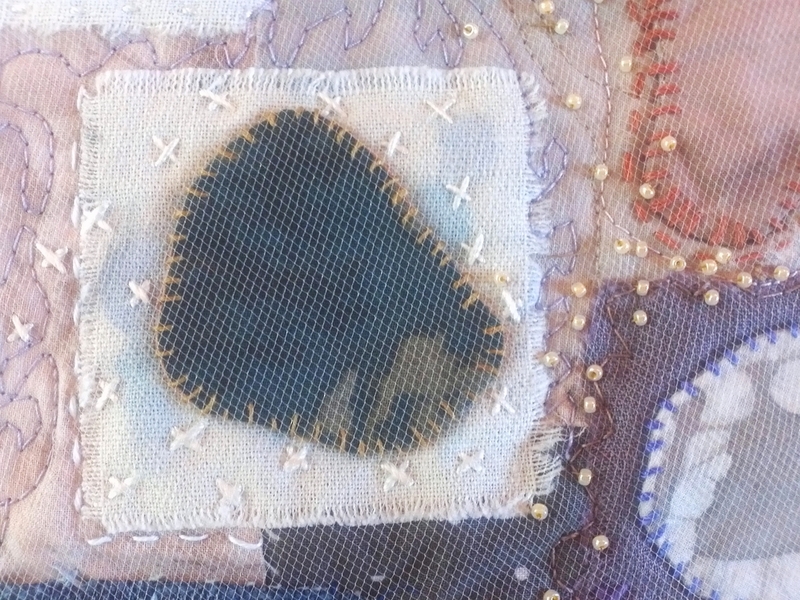 Quilting and embroidery on dyed and commercial cottons. 21” x 31”. For the Texas Tech museum exhibit Red Hot and Quilted. For the Texas Tech museum exhibit, Red Hot and Quilted. Hand and machine quilting on hand dyed and commercial cottons. Blue fabric printed from my original painting, Deeper. 15” x 58”. Shown at the Buddy Holly Center exhibit, Sky’s the Limit.